The Euphrates suffers from high salinity during the irrigation season due to drainage of irrigation effluent. Salinity increases from 400 milliseimens per centimeter (mS/cm) at Jarabulus on the Turkish border to more than 1,000mS/cm at Bukamal on the Iraqi border. This high salinity is a major threat especially during dry spells/droughts, resulting in salinization of land and yield reduction. Bacteriological contamination occurs occasionally as a result of wastewater disposal from urban areas (e.g. Deir ez-Zor). The Euphrates, Baath and Tishrin dams show stable chemical indicators within the standards for drinking water. The Baath Dam shows bacteriological pollution due to sewage disposal from Dina. This natural reserve is under threat from pollution from sewage water, nutrients and pesticides from surrounding agricultural fields. The Sajur River, a tributary of the Euphrates, shows high levels of biochemical oxygen demand (BOD) and ammonia. 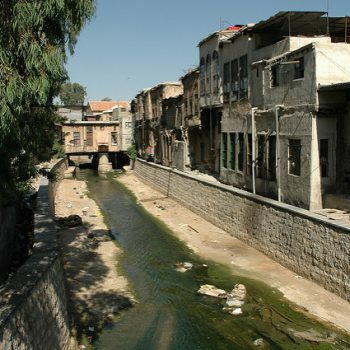 The Quaik River has chromium at levels above standards due to pollution from tanneries and sewage from Aleppo, threatening Aleppo’s drinking water. Irrigation in the Es-Siha area poses a public health threat as a result of the use of highly polluted water from the Quaik River. The biggest contamination problem facing the Tigris River is pollution of reservoirs with untreated sewage. This is especially the case for Lake Assad, which is polluted by sewage from al-Hasakah, in the far north-eastern corner of Syria, and oil refining through Taban spring. The water quality in the Tigris’ other reservoirs is sufficient for irrigation and, generally, drinking water use. In the irrigation season, groundwater sources have increased salinity levels. Water resources in the coastal basin are of a high enough quality for drinking water and other uses. In some cases, surface water has high levels of suspended solids, nitrates, ammonia and e-coli, but mostly within the limit for irrigation use. 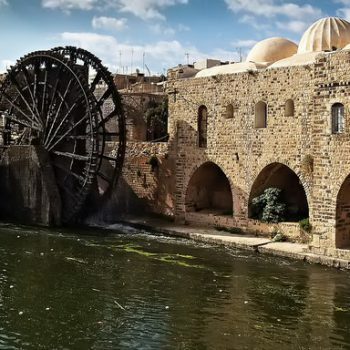 Effluent from olive processing factories is polluting groundwater and springs, especially in the Tartous area and Difa, threatening drinking water supply. Some deep wells show high levels of salinity due to salt intrusion. In addition, some coastal reserves have high nutrient levels and several beaches are threatened by bacteriological contamination caused by sewage disposal. Groundwater is highly saline in certain areas due to irrigation effluent and high evaporation rates. The downstream part of the Orontes River shows substandard quality for suspended solids, nitrate and BOD due to dense agricultural and industrial activities (a fertilizer plant in Homs and several sugar refineries) as well as population centers. Drinking water sources are threatened by high pollution levels. Lake Qattinah is polluted by industrial waste, including nitrate, phosphate and heavy metals, and its aquatic flora and fauna are threatened. Groundwater quality is still sufficient for use in agriculture. Urban and rural domestic wastewater result in BOD levels above the standard downstream in the Barada. The Awaj has a slightly better water quality than the Barada. Springs and groundwater show high levels of e-coli due to percolation of sewage. In the Ghouta area and Damascus Rif, where many wells are used for drinking water, nitrate concentrations of 120-200 milligrams per litre (mg/L) are up to four times the World Health Organization standard. High concentrations of chromium of up to 5 mg/L in surface water are a result of effluent from tanning industries around Damascus, contributing to the threat to drinking water supplies in the basin. Water quality in reservoirs is deteriorating due to untreated wastewater disposal and agricultural drainage (from e.g. Ibtaa, Udwan, Tafas, Daraa al-Sharqi, Maaraba, Aslaha, Habran and Jabal Alarab). High nitrate and ammonia concentrations are found in groundwater (e.g. in Yarmouk, Alzabadan and Altashgiel valley). Spring water is generally of good quality except for limited bacteriological contamination and high nitrates in the Sweida area in the south-west. Some groundwater areas also have (naturally) high salinity levels. The major threat comes from high pathogen levels in irrigation water and high nitrate and ammonia levels in wells for drinking water. Well and spring water in the Awaj basin is bacteriologically contaminated because of sewage discharge. The concentrations of nitrates in some wells in Ghouta exceed the limits set for drinking water. In the coastal region, wells used for drinking purposes are contaminated with high concentrations of nitrates and ammonia because of sewage discharge and fertilizer use. Water salinity is also high in some wells due to seawater intrusion into the fresh groundwater aquifers. Available water quality data clearly show that pollution of groundwater and surface water with domestic and industrial waste has occurred across the country, in the vicinity of all major settlements. In 2011, about 89% of the urban population and 69% of the rural population was connected to sewer networks, whereas 71% of the urban population and only 7% of the rural population was connected to WWTPs. Water sources suffered from pollution by industrial and domestic waste before the outbreak of the war in 2011. A comprehensive plan to address the problem was initiated by the Ministry of Housing and Construction, which included a number of environmental regulations and an ambitious master plan to treat domestic wastewater across the country. The plan also included the construction of 345 centralized and decentralized treatment plants with a total capacity of 1.2BCM/day at a cost of $1.7 billion. The plan, when realized, was expected to serve about 75% of the total population. However, it was halted because of the ongoing war as well as funding challenges. Indeed, the war has exacerbated Syria’s overall water situation, with many drinking water projects going out of service as a result of a lack of maintenance and operational funding or destruction. The war has also added to the sources of pollution due to the absence of environmental control, random oil refining and the dumping of bodies. In 2013, more than 100 corpses were found in Quaik River in Aleppo. 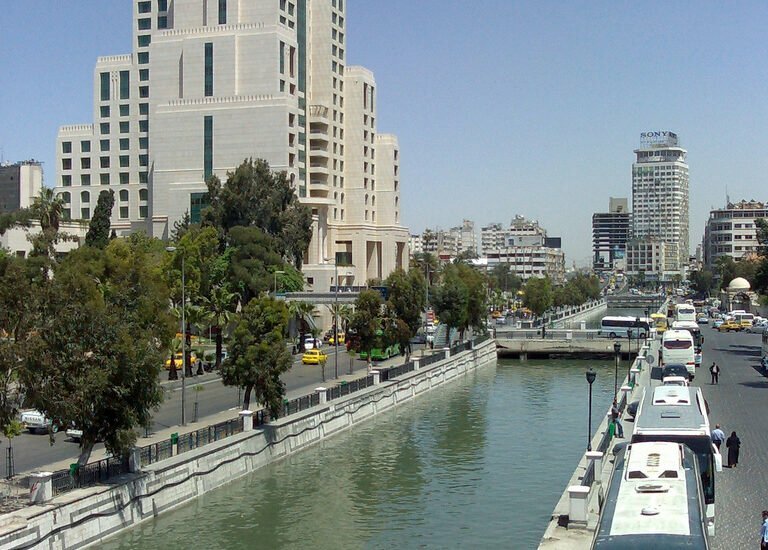 Water pollution and unlicensed water vending by tanks has led to the spread of a number of diseases, including Leishmaniasis in Aleppo and Deir ez-Zor and typhoid fever around Damascus. Ministry of Housing and Construction. 2011. National Performance Indicator Drinking Water and Sanitation Report.